But there was something much more majestic, even imperial, about the Benazir I met when she was Prime Minister. She walked and talked in a deliberately measured and regal manner and frequently used the royal ‘we’. At my interview, she took a full three minutes to float down the 100 yards of lawns separating the Prime Minister’s house from the chairs where I had been told to wait for her. There followed an interlude when Benazir found the sun was not shining in quite the way she wanted it to. ‘The sun is in the wrong direction,’ she announced. Her hair was arranged in a sort of baroque beehive topped by a white gauze dupatta. The whole painted vision reminded me of one of those aristocratic Roman princesses in Caligula. Six hours before she was executed, Mary, Queen of Scots wrote to her brother-in-law, Henry III of France: “…As for my son, I commend him to you in so far as he deserves, for I cannot answer for him.” The year was 1587. Benazir’s last decision was in the same autocratic mode as its predecessors, an approach that would cost her – tragically – her own life. Had she heeded the advice of some party leaders and not agreed to the Washington-brokered deal with Pervez Musharraf or, even later, decided to boycott his parliamentary election she might still have been alive. Her last gift to the country does not augur well for its future. How can Western-backed politicians be taken seriously if they treat their party as a fiefdom and their supporters as serfs, while their courtiers abroad mouth sycophantic niceties concerning the young prince and his future. Some of us had hoped that, with her death, the People’s Party might start a new chapter. After all, one of its main leaders, Aitzaz Ahsan, president of the Bar Association, played a heroic role in the popular movement against the dismissal of the chief justice. Mr Ahsan was arrested during the emergency and kept in solitary confinement. He is still under house arrest in Lahore. Had Benazir been capable of thinking beyond family and faction she should have appointed him chairperson pending elections within the party. No such luck. The result almost certainly will be a split in the party sooner rather than later. 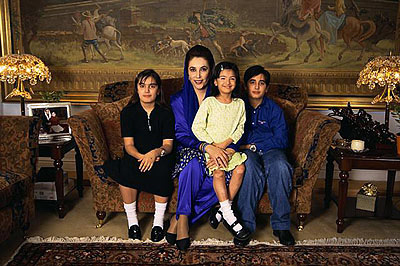 Mr Zardari was loathed by many activists and held responsible for his wife’s downfall. Once emotions have subsided, the horror of the succession will hit the many traditional PPP followers except for its most reactionary segment: bandwagon careerists desperate to make a fortune. Meanwhile there is a country in crisis. Having succeeded in saving his own political skin by imposing a state of emergency, Mr Musharraf still lacks legitimacy. Even a rigged election is no longer possible on 8 January despite the stern admonitions of President George Bush and his unconvincing Downing Street adjutant. 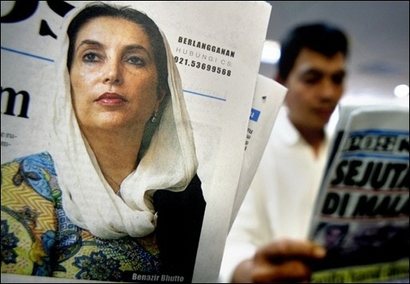 What is clear is that the official consensus on who killed Benazir is breaking down, except on BBC television. It has now been made public that, when Benazir asked the US for a Karzai-style phalanx of privately contracted former US Marine bodyguards, the suggestion was contemptuously rejected by the Pakistan government, which saw it as a breach of sovereignty. Now both Hillary Clinton and Senator Joseph Biden, chairman of the Senate Foreign Relations Committee, are pinning the convict’s badge on Mr Musharraf and not al-Qa’ida for the murder, a sure sign that sections of the US establishment are thinking of dumping the President. Their problem is that, with Benazir dead, the only other alternative for them is General Ashraf Kiyani, head of the army. Nawaz Sharif is seen as a Saudi poodle and hence unreliable, though, given the US-Saudi alliance, poor Mr Sharif is puzzled as to why this should be the case. For his part, he is ready to do Washiongton’s bidding but would prefer the Saudi King rather than Mr Musharraf to be the imperial message-boy. A solution to the crisis is available. This would require Mr Musharraf’s replacement by a less contentious figure, an all-party government of unity to prepare the basis for genuine elections within six months, and the reinstatement of the sacked Supreme Court judges to investigate Benazir’s murder without fear or favour. It would be a start.